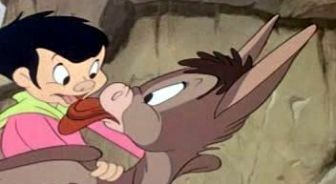 is the seventh movie in the Walt Disney Animated Classics series, that plots an adventure through parts of Latin America, combining live-action and animation. This is the second of the Disney package films of the 1940s. The film received two Academy Award nominations for Best Sound (C. O. Slyfield) and Best Scoring of a Musical Picture (Edward H. Plumb, Paul J. Smith, and Charles Wolcott). The movie was produced as part of the studio's good will message for South America. 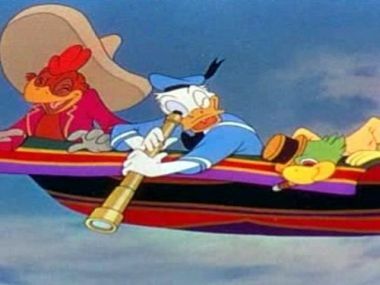 Starred Donald Duck, who in the course of the film is joined by old friend Jose Carioca representing Brazil, and later makes a new friend in the persona of pistol-packing rooster Panchito Pistoles, representing Mexico. The music of the Mexican part was written by Mexican composer Manuel Esperon. The main song for the Mexican part is "Ay Jalisco, No Te Rajes! ", one of Esperon's most famous songs. Several Latin American stars of the period appear, including singers Aurora Miranda (sister of Carmen Miranda) and Dora Luz, as well as dancer Carmen Molina. Also, is plotted as a series of self-contained segments, strung together by the device of Donald Duck opening birthday gifts from his Latin American friends. It is Donald Duck's birthday. He receives three presents. The first present is a film projector, which shows him a documentary on birds. The next present is a book given to Donald by Jose Carioca himself. 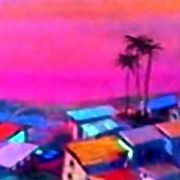 This book takes them to Bahia. The third present is a pinata given to Donald by Panchito Pistoles. In the pinata, there are many surprises. The celebration ends with Donald Duck being fired away by firecrackers in the shape of a bull. Throughout the film, we see a voiceless character called the Aracuan Bird at random moments. He usually pesters everyone, sometimes stealing Jose's cigar. His most famous gag is when he re-routes the train by drawing new tracks. 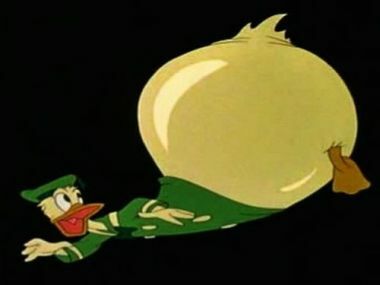 Clarence Nash - Donald Duck, José Oliveira - José Carioca, Joaquin Garay - Panchito Pistolas, Aurora Miranda, Carmen Molina, Dora Luz, Sterling Holloway - Narrator (The Cold-Blooded Penguin), Frank Graham - Narrator, Fred Shields - Narrator, Francisco "Frank" Mayorga - Mexican Guitarist, Nestor Amarale, Almirante, Trío Calaveras, Trío Ascencio del Río, Padua Hills Player, Carlos Ramírez - Mexico. Directed by Norman Ferguson, Clyde Geronimi, Jack Kinney, Bill Roberts, Harold Young; story by Homer Brightman, Ernest Terrazas, Ted Sears, Bill Peet, Ralph Wright, Elmer Plummer, Roy Williams, William Cottrell, Del Connell, James Bodrero; cinematography by Ray Rennahan; film editing by Donald Halliday. 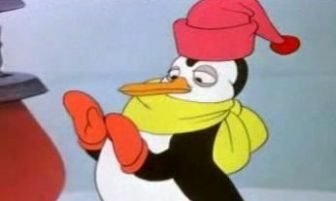 who describe the story of a penguin named Pablo, reproducing images of the penguins of Punta Tombo in Argentina along the coast of Patagonia, "Pablo the penguin" is so fed up with the freezing conditions of the South Pole that he decides to leave for warmer climates. 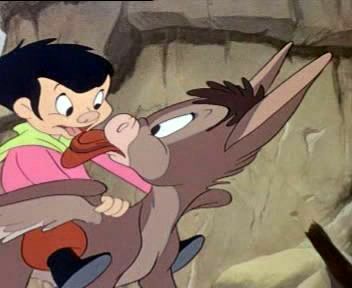 who describe the adventures of a little boy from Uruguay and his winged donkey, Burrito. 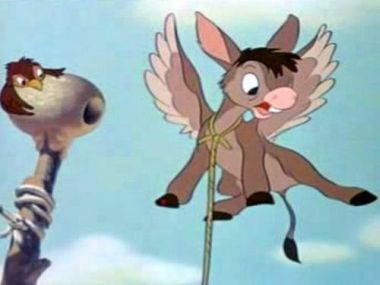 It is believed the donkey is modeled after hefty Latin lover Don Juan De Gama. 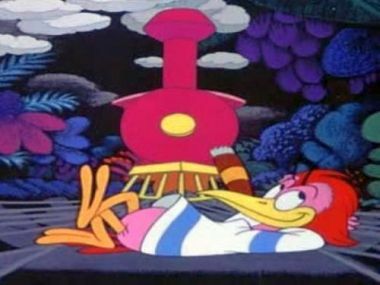 who describe pop-up book trip through Baia the capital of the Brazilian state of Bahia, as Donald Duck and Jose Carioca meet up with some of the locals who dance a lively samba and Donald starts pining for one of the females. who describe the story of a group of Mexican children who celebrated Christmas by re-enacting the journey of Mary, the mother of Jesus and Saint Joseph searching for room at the inn. "Posada" means "inn", and they are told "no posada" at each house until they come to one where they are offered shelter in a stable. This leads to festivities including the breaking of the pinata, which in turn leads to Donald Duck trying to break the pinata as well. 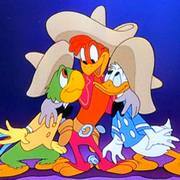 who describe how Panchito gives Donald and Jose a tour of Mexico on a flying serape. Several Mexican dances and songs are learned here. A key point to what happens later is that Donald seems to be a "wolf" to the ladies again, hounds down every single one he sees, and tries to gain return affections, but fails. who describe how Donald falling in love with a singing woman. The lyrics in the song itself play parts in the scenarios as to what is happening as well. 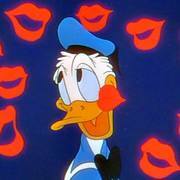 who describe how a kiss lead to Donald going into the phrase "Love is a drug." Donald constantly invisions sugar rush colors, flowers, and Panchito and Jose popping in at the worst moments. The scene changes after Donald manages to dance with a girl from the state of Oaxaca. The two dance to the song "La Sandunga." 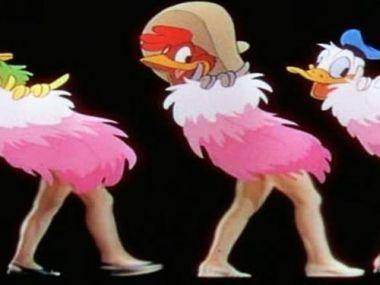 The girl begins by singing the song, with Donald "quacking" out the rest of the chorus. Donald Duck: What's this? Panchito: This is your gift from Mexico, Donald: a pinata! Donald Duck: Oh, boy, oh, boy, a pinata! What's a pinata? Panchito: A pinata is full of surprises. Presents. It's the very spirit of Christmas. 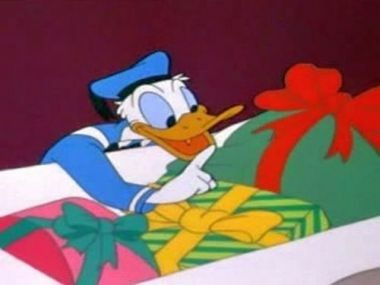 Donald Duck: Christmas! Jingle bells, jingle bells, jingle all the way... Panchito: Oh, no, no, Donald! For goodness sake, not "Jingle Bells". In Mexico, they sing "Las Posadas".